Never one to follow the herd, Sony has yet again attempted something different with the release of the BDP-S760 into a market where plagiarism is positively encouraged. 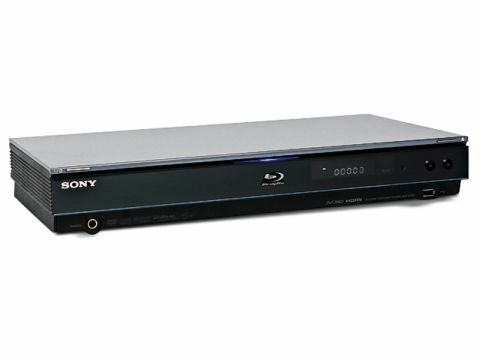 Where most Blu-ray decks today offer an abundance of special features, streaming-abilities and compatibility with a host of video codecs (popular and otherwise), the manufacturer's latest player doesn't. Indeed, it has purposely and bravely avoided adopting the gadgetry and gimmicks of its competitors and concentrated on making a machine that just plays Blu-rays well. Very well indeed. Naturally, the BDP-S760 also spins DVDs and CDs and has very capable upscaling talents, but that's a prerequisite and not its major USP. This player is primarily designed to eke out the best picture and sound performance from your hi-def platters, and you've got to admire such resolute dedication. Especially when it works so well. Using the same picture processing found in Sony's top-ofthe range BDP-S5000ES helps. And, while there are a number of other reasons to invest the bigger bucks on a high-end machine (all £1,000-ish of them) if you can afford it, finding this processing on a sub-£400 player is a revelation. It's hugely encouraging to know that the rest of us can enjoy premium-quality video without breaking the bank. That's partly down to costs being trimmed in other areas – build quality being the major one. The S760 is neither as sturdy or as massive as the 5000ES. Also, while I may not be particularly fussy on what my equipment looks like when it's shoved into a rack or a stand under the telly, I'm not a huge fan of decks where the entire fascia has to gape open whenever a disc is inserted or ejected. It just seems flimsy. I believe it's the one instance where this player's design, in and out, has been over-egged, and could have benefited from being more reserved. However, although rigidity is questionable, stability is not. Indeed, Sony claims that its Precision Drive HD technology is capable of reading information on a scratched or even bent Blu-ray disc. Now, while I believe that grubby, slightly warped and worn discs may be readable – it certainly didn't spit out any of the discs lurking in the corners of the HCC Tech Labs (some of which are distinctly war-torn and battered) – I do not, for one instance, expect a disc with a circular scratch or severe distortion to work. I'm not about to bend any of my discs to find out though, and I wouldn't recommend you do either. Such bombastic claims aside, the BDP-S760 did indeed play every disc I put into the player, accurately and quietly. It also did so fairly speedily. Thankfully, Blu-ray has rapidly become, erm, rapid, and I think we've finally reached an age where any self-respecting BD player has a decent loading time. Hopefully, we needn't harp on about it for much longer, and boot-up and Java-loading speeds will be standardised. To be honest, I'd much rather devote my time and attention on something more worthy – the BDP-S760's in-built wireless n modem, for example. LG was first to offer this technology on a Blu-ray deck with its BD390, but it's not exclusive and it would be good to see all machines follow suit. The tech is certainly welcome in this instance as it means that you can plonk the Sony player anywhere you like – you're not regimented by the availability of an Ethernet hub. Admittedly, with scant few streaming abilities on offer (you can merely look at photos stored on a networked computer or NAS drive), there's little need for the enhanced bandwidth that 802.11n technology offers over 802.11g, but at least you don't have to wait an age for BD-Live content to appear. It's also worth noting that you'll need a USB memory stick for some BD-Live content as there's no internal storage. Thankfully, the USB port is on the front panel, not squirrelled around the back. These are, however, much like its 7.1 analogue audio outputs, not the real issues. The overriding strength of the S760 is its video and audio performance, which is exemplary. It sings like a bird (as long as the bird can also replicate gun shots with faultless accuracy), and can paint a picture as detailed and bursting with life, colour and depth as a Renaissance master. The Sony deck ate my Transformers 2: Revenge of the Fallen BD for breakfast, making the most of the blockbuster palette and gleaming chrome visuals, and keeping pace with the frequent camera pans and fast-moving SFX. I don't think there's any player currently available at this price point that compares for Blu-ray playback. I'm still a massive fan of LG's BD390 for its media-streaming abilities, but maybe I'll have to find a place in my rack for the BDP-S760 as well. It is a reference machine for the budget conscious.